Reach for Blackhawk's holsters when a secure and comfortable carry is essential, for large automatic pistols with barrels from 3.25 to 3.75 inches. Reach for Blackhawk &apos;s holsters when a secure and comfortable carry is essential, for large automatic pistols with barrels from 3.25 to 3.75 inches. Ambidextrous belt or inside-the-pants configurations. Belt loops act as covers for reversible retention strap and thumb break. Fits belts up to 1.75” in a traditional vertical position. 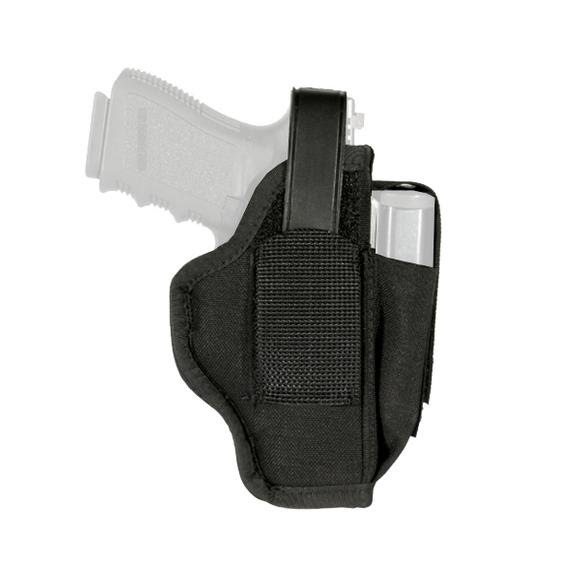 Fits belts up to 1.5” when worn horizontally as a middle-of-the-back holster. Spare magazine pouch with adjustable flap on front of holster. Non-stretch hook and loop retention strap and molded thumb break.